School year 2012-13 is going to end and graduation day is approaching. One of the most memorable moments of being a student is the graduation day. 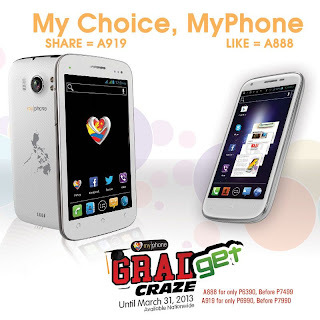 To make it even more memorable MyPhone offers a 'Gradget Craze' sale where one of your favorite and wish to own Android phones from Myphone offered on sale price. If you’re looking for a gadget as a graduation gift to your love ones, you may find MyPhone’s list of gadgets included in Gradget Craze. MyPhone’s ‘Gradget Craze’ is available nationwide until March 31, 2013.